Shortly after the Deepwater Horizon oil spill, concerned elected officials and business leaders in Baldwin County, Alabama met together at a local realty office to brainstorm ideas of how to manage the unfolding economic, social, and ecological crises. From this gathering emerged the Coastal Resiliency Coalition (CRC); the meeting place became known as the “War Room” as this organization led a fight for the survival of their community. Interviews with individuals involved in this effort and observation of a group meeting demonstrated that of particular importance for this group were the economic and health (physical and mental) impacts of the oil spill. In the months following the spill the CRC provided a forum for local businesses to join together and make plans to address the economic impact of the oil spill. It also connected businesses to important resources that facilitated economic recovery. The CRC also worked with local groups in the region to rebrand Gulf Coast industries, including tourism and seafood. Developing marketing strategies and taking an active role in communications was a critical activity of the CRC as a flurry of media attention was focused on the Gulf Coast and on Alabama beaches in particular. In 2012 the CRC gained status as a 501(C) nonprofit organization. Its efforts to help local businesses survive and rebound from the oil spill have largely been realized. Tourist revenue set record highs in 2012 generating $40 million more in taxable lodging revenue than 2011. By request of the county emergency manager, the following report was prepared for Baldwin County: Baldwin County Resilience Report. This report was used as part of a community-wide discussion to improve disaster preparedness and resilience. Additionally materials on the importance of business continuity and disaster recovery planning were also provided. 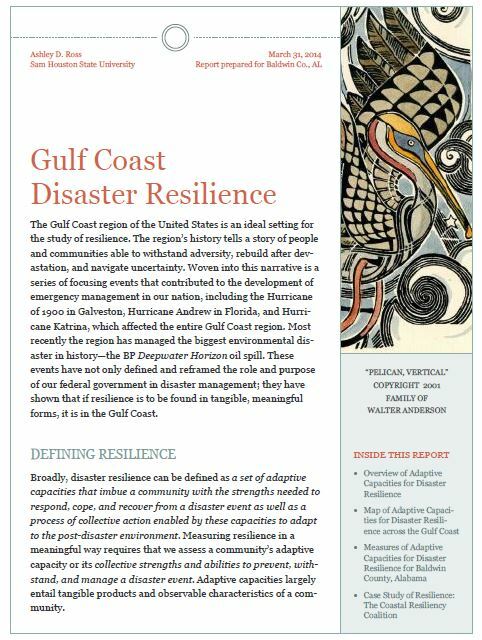 In 2012 a student research program was created to support the study of Gulf Coast disaster resilience. The project was supported by the Department of Homeland Security and involved interviewing county emergency managers in the 75 counties adjacent to the Gulf of Mexico. Twelve students from five institutions participated: Florida Atlantic University, Louisiana State University, Texas A&M University-Corpus Christi, Texas A&M University at Galveston, and Tougaloo College. They participated in a training workshop that covered interview protocol and data coding as well as professionalism and coordination of logistics. The manual for this program is available here: Student Research Program Manual. Student researchers shown with emergency manager interviewees. Left to right: Melissa Beeler and Samantha Duffy of Texas A&M University-Corpus Christi with Stan Upton, Refugio County, Texas; Marcus Pierre and Gina Wilson of Louisiana State University with Dawson Primes, Tangipahoa Parish, Louisiana; and Roshae Wilson and Charden Virgil of Tougaloo College with John Albert and Brian Adams, Hancock County, Mississippi.